Where is all this water going?!?!? That’s the hundred-dollar (literally) question I’m asking myself after going through my most recent 8 months worth of water bills. It’s week number two of the summertime consumtion challenge. This week’s task is to get a better understanding of what your current water usage really is. It’s an odd pattern, partly because we were traveling for a couple months this winter. But why’s it been so high lately? And how high is too high? I found this exercise really eye-opening. 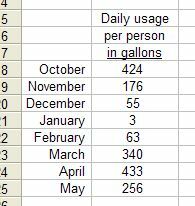 I can come up with no reason why our usage would exceed 200 gallons per day for each of us, let alone over 400! It’s rained a lot so we haven’t even irrigated our lawn. I am thinking I probably have a leak. To further investigate I made sure all the water in the house was off, popped open the water meter cover in the parkway, and sure enough, the little red triangle was spinning, indicating water running somewhere in my house. I wish I could report that I’ve found the source of the problem, but I haven’t gotten that far yet. Unfortunately the little spinning triangle doesn’t tell you exactly what’s wrong, just that there’s a problem somewhere. I suppose that’s what makes it a challenge. At Home Depot, How Green Is That Chainsaw? For some ideas about how to decide for yourself, visit my post from a few weeks back about how to evaluate green products. Summer’s officially here! And so we’ve launched the project to reduce our electrical and water consumption. This first week is all about electricity measurement, because it’s more difficult (and less fun) to reduce when you don’t know your starting point. Objective number one: follow the money. If you are challenging your consumption along with me, find your electricity bills for the last year. 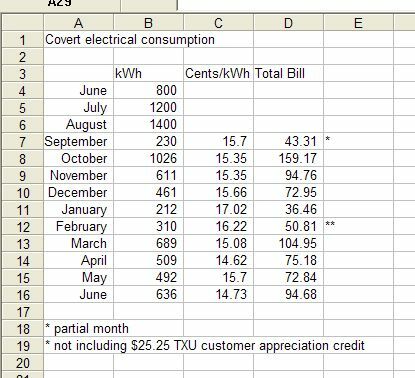 Use excel, google spreadsheets or pen and paper to create a chart like this one showing usage, kWh charge, and your total bill. If you are feeling ambitious you could add a column for the average temperature for each month. If you are feeling more ambitious you could turn the data into a chart. Unfortunately we didn’t move into this house until the middle of Sept. I called TXU and asked for the data of the previous tenant. They would provide approximatge kWh for those months but that was it. Because we moved during Sept. that month is partial, and so I believe that figure is artificially low. We were out of the country and pretty much not living in the house Nov.-Jan.
Because of all these factors, the standard error here is plus-or-minus a LOT, but it still offers a general trend. A/C must be by far the largest portion of my electrical usage. Not a surprise. By extension it’s also the greatest opportunity for reduction in consumption. Over the course of a year a rough average monthly kWh consumption rate for my house is 670/month. Whatever billing plan I am on, the kWh charge fluctuated by a couple cents each month. Based on the one month of overlapping data, I can assume that the cooler recent weather has had a direct effect on our electricity bill by reducing our use of the A/C. The fridge must be using about 200 kWh / month by itself given that when we were not here, we still used this amount. At 15 cents/kWh that’s $30/month to keep the food cold. Not sure yet if that’s a lot or not compared to others, I will have to see. So, given all this loose data, what will be my consumption challenge goal? I suppose it’s copping out to say awareness? Then I’ll say to save 10% over the same time last year, just for the sake of comparison. I’ll compare both consumption and total billing. How difficult this will be depends on things like weather and how our consumption pattern compares to the single retired lady who occupied this house before us. Did she keep the thermostat at 68 or 78? I guess I’ll find out. To kick-start the savings we are setting the thermostat at 78 or higher. I read that for every single degree one adjusts the thermostat, one saves 10% on electrical billing. We shall see. It’s in the Home section. 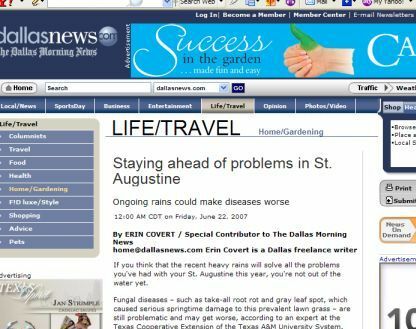 Here it is online: Turf disease story. Smart meters, the new power diet? Researching the launch of my consumption challenge I’ve learned about a really interesting device this week — the smart meter. It goes someplace visible inside the home, and it connects to the main power meter outside. The display shows more useful, specific and immediate information than the outside meter. I’ve not seen one in person, but it sounds like if you turn something on, you should immediately see a bump in usage on the smart meter. Apparrently they are more widely used in the rest of the world. What I think is cool about something like this is that it’s so immediate. Right now, at least to me, using electricity is kind of like overeating. I see the cookie and know it’s got more calories than I need, but hey, it won’t really matter until later when I can’t fit into my jeans. Likewise — sure, running the A/C at 65 degrees uses a heck of a lot of power, but hey, I won’t worry about it until I get that really high bill. The smart meter would step in sooner, an electrical Bob Greene if you will. To my knowledge they are not widely available, but reps from both TXU and Reliant told me that they are testing these for later release here in TX. flip house 001, originally uploaded by espeedy123. Look out Ginger, there’s a new chick who flips. 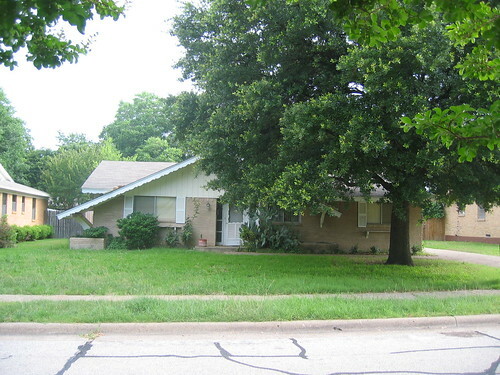 Check out the before shots of the cute little house on B street that we are buying, renovating, and selling, hopefully quickly and for a nice profit. The learning curve on this first one will no doubt be steep. I intend to post what I learn, starting with what I now know about concrete slab foundations and how you fix them when they are out of whack. Coming soon. Market Ready: Should I Remove Sports Memorabilia Before Showing My Home?